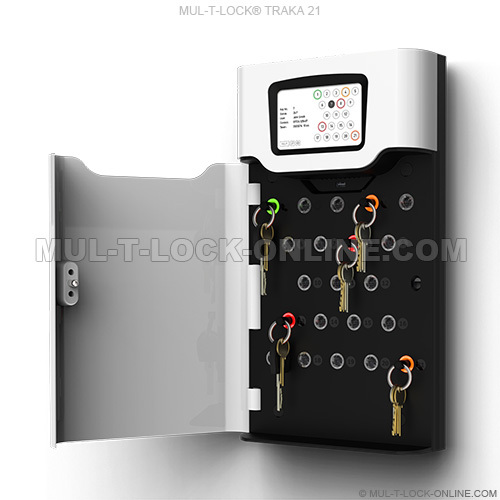 Traka21’s innovative plug and play system provides small to medium size businesses with the very latest in intelligent key management. Simple, efficient and cost-effective, Traka21 helps trace and account for every key or keyset, which are individually locked in place, ensuring that critical business operations are never jeopardised. Despite the increasing sophistication of commercial security, the management of business critical keys remains a weak link. At best they’ll be issued from a security desk. At worst they’ll be hung on a hook in open view or hidden somewhere at the back of a manager’s desk drawer. If you lose them or they fall into the wrong hands, you risk losing access to buildings, facilities, secure areas, equipment, machinery, lockers, cabinets and vehicles. Traka21 authorises, secures and monitors all of your keys, automatically controlling and recording when a key is used and by whom – information which is made available either through the cabinet’s display or by export on a USB pen drive.